UHF 4 Frequency Handheld System. Introducing the Trantec S4.4 UHF Wireless Microphone System - undoubtedly one of the most efficient, flexible, user friendly and economical systems on the market. From rock n roll to conferencing, the S4.4 will perform to the limits. If there ever was a time to go wireless, it’s now! 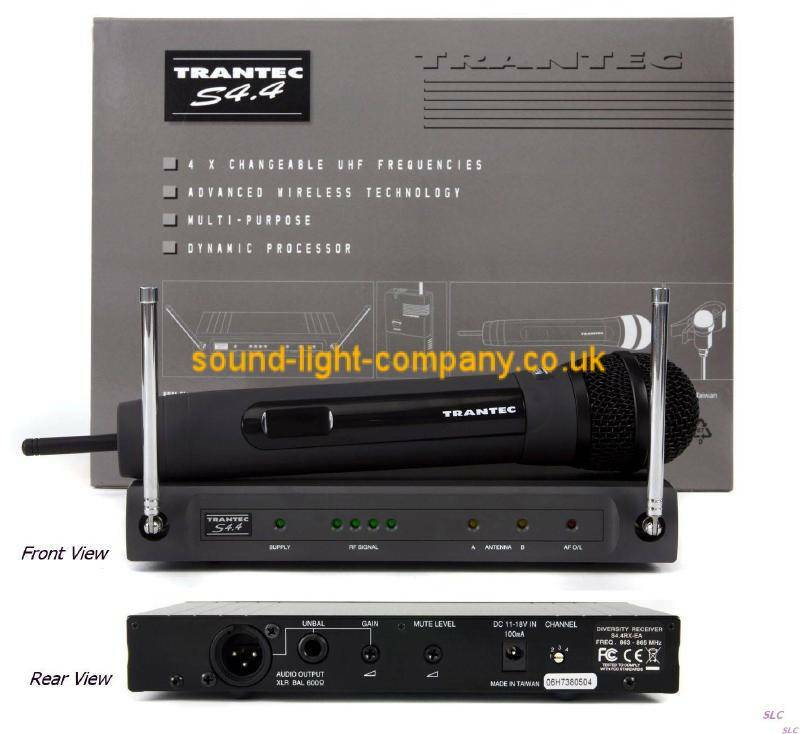 The Trantec S4.4 MD Handheld System comprises of a fully integrated Handheld Microphone incorporating a Cardioid Dynamic Capsule and is most suited to General Vocal Applications. • Fully Optimized Audio Processor. • 4 User Selectable UHF Channels that can be operated simultaneously. • Diversity Receiver Operation for maximum performance. • User Adjustable Audio Output Level makes pitching to your amp/mixer simple. • User Adjustable RSSI/Squelch for uninterrupted performance. • Designed to operate license free in most EU countries. (EA Band 863-865 MHz). Fully synthesised 4 channel PLL Quartz Controlled FM Wireless Microphone System incorporating a Dual Conversion Diversity Receiver with Integral Audio Dynamics Processor. Handheld 80Hz - 16KHz +/- 3dB. INDICATORS: 4 position RF Bargraph, AF peak (overload), Power, Diversity A/B. OPERATING VOLTAGE: 9V @ <50mA. OPERATING TIME: approx 10 hours. CONTROLS: Frequency select, On-off switch.